Belfast’s Lord Mayor Niall O Donnghaile has done more in his six months in office to promote peace and reconciliation between the citizens of Belfast - nationalist, unionist and other - than the DUP’s Sammy Wilson has done in his lifetime in politics or for that matter the mayor’s deputy, Ruth Patterson, also a member of the DUP. 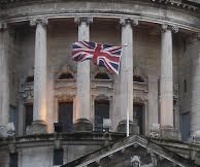 Both politicians daily insult the nationalist population of Belfast - men, women and children - by their support for flying the union flag on top of Belfast City Hall. It has been flying illegally for more than 20 years. Inside the city hall there are few emblems associated with the historical or cultural traditions of the nationalist people of Belfast who make up half of the city’s population. Yet the area is festooned with unionist and British emblems, many associated with celebrating wars fought by the British army. DUP politicians not only insult the living, from a nationalist background, they also insult the dead. A few weeks ago Mr Wilson donned the garb of his party’s buffoon at their annual conference and entertained hundreds of DUP members, who responded in guffaws of laughter, while he mocked the 10 republican prisoners who died on hunger strike in 1981. Ms Patterson is proud of having served in the UDR, a regiment so discredited that it had to be disbanded. I have not heard Ms Patterson once criticising or distancing herself from its despicable record. As deputy mayor she has refused to shake the mayor’s hand. So it is difficult for me, and many from a nationalist background, to take seriously criticism of Mayor O Donnghaile from these unionist politicians claiming to act out of concern for the teenage girl, a British army cadet, at the centre of the row about a Duke of Edinburgh award. The mayor made it clear in his statement that he did not intend to cause offence to the teenager and apologised to her. I believe his past actions, representing all the people of Belfast in his duties as mayor, indicate his sincerity on this matter. I also think the reaction of the girl’s family suggest they accept the mayor’s statement. In my view that should be understand or believe in reconciliation. There is a battle taking place inside the city hall, led mainly by Sinn Fein councillors, to secure institutional recognition of the cultural tradition of the nationalist people of Belfast. This battle has been caused by the unionist parties’ refusal to voluntarily agree to accept symbols and emblems associated with nationalists on public display inside and outside the city hall. A similar situation exists in Lisburn council, with one exception - Sinn Fein councillors forced the unionist councillors and the council administration to uphold the law in relation to flying the union flag. The council used to fly it daily. Now it flies 17 days of the year in accordance with the law. Republicans seek and work to bring about reconciliation with the unionist people within the north and within this island and so do many people from a unionist and loyalist background. That work is done on the basis of mutual respect. Mutual respect is about sharing those parts of each other’s tradition which people are comfortable with. It is not about imposing on anyone an uncomfortable tradition. Republicans do not expect unionists to wear an Easter lily. Nor should anyone expect republicans to express approval of any level of the British army. Its occupation of Ireland has been disastrous for the unionist and nationalist people of this island. I would actively discourage anyone, cadet or otherwise, from joining the British army. That army engages more in war than in peacekeeping. Unionists might bluster as they did at the city hall about the mayor’s handling of the Duke of Edinburgh awards. But the winds of change continue blowing through that particular chamber. Before the night was over the unionist lost a vote to erect an Irish language sign, Nollag Shona Daoibh (Happy Christmas) on the city hall. And that is the enduring and unending story unionists continue to resist to no avail.